Part of my 1000 post celebration. For about the past four years I have done an occasional end of the week post I title First Nations/Aboriginal Fridays where I review a work by a First Nations author. This all began when I joined the Canadian Book Challenge, and John , the host, suggested that we could choose a theme for our books. Since at that time I had read very few books by First Nations authors, I thought I would try and complete the challenge that way. 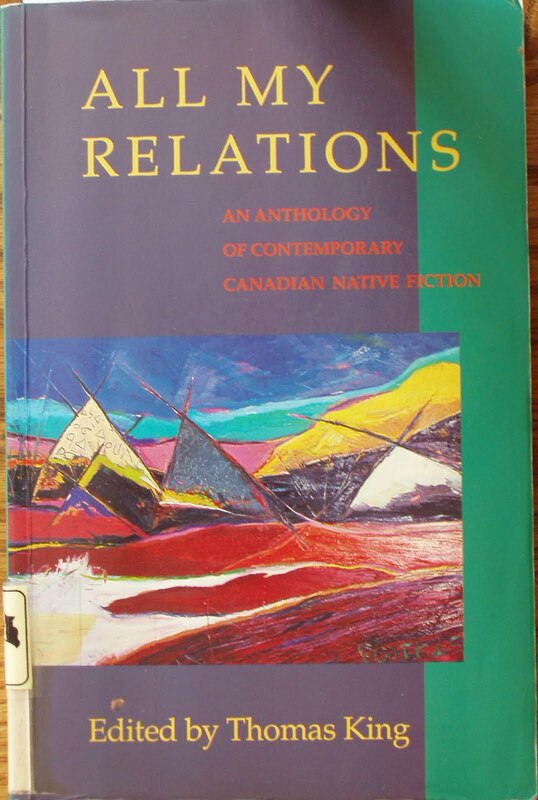 At first it was difficult to find books, but then I found All My Relations: An Anthology of Contemporary Native Fiction edited by Thomas King. This gave me lots of authors to search for and that lead to further authors etc. Now my wish to read list of First Nations authors is pages long. Highlights from past First Nations/Aboriginal Fridays posts. Best author photo ever is that of Michael Kusugak, found in his book Curse of the Shaman: A Maple Island Story. Youngest author who's book I have reviewed. The Delta is my Home by Tom McLeod and Mindy Willet. Most touching family memoir, Crazy Dave by Basil Johnston about his uncle. While I was training for my half marathon, I learned about Tom Longboat, who ran and won the Boston Marathon, but I knew next to nothing about him till I read The Man Who Ran Faster than Everyone by Jack Batten. And finally, there is the book that got me interested in reading humour and short stories, (and the best book title) Furious Observations of a Blue-Eyed Ojibway: Funny you don't Look Like One Two Three by Drew Hayden Taylor. To find more First Nations books that I have reviewed, check the list of tags in the side bar where they are also listed by Tribe membership. One of the most satisfying parts of reviewing books by First Nations Authors, is that a large number of students visit and read these reviews. I can tell when a book is being studied at some school/college or university. All of a sudden I have dozens of visitors to a particular post and then none again for a few months. I do wish that they would occasionally leave a comment telling me which school they are from, I do have a curious nature. Pierre L'Errant is a secretive man. He is travelling to the Otter Lake Reserve, but his is exhibiting mysterious behaviour such as hiding in the airport all day and only leaving the buildings when it is night time. On the Reserve, sixteen year old Tiffany Hunter has been told by her father that she must move all her belongings to the room in the basement; no explanation is given to her. Being a teenager is tough enough when your mother runs off with another man and you are a visible minority in your school. Now her father doesn't appear to want her in his daily life. This book has all the earmarks of a Modern Gothic novel: mystery and horror. Next, add in a little romance and the angst that accompanies all teenage affairs of the heart and the stage is almost set. We also learn, that the swamp at the north end of the reserve is believed to be populated by unseen monsters and demons. Thank goodness I wasn't sitting home alone while reading this. I can't tell you any more about the story as I'm sure I would spoil the suspense and mystery. We do spend a lot of time with Tiffany and learn of her troubles of coming of age while living first, in a broken family and then by being the outsider at school and in her boyfriend's group of friends. She also is dealing with the heritage of the Hunter Clan. Her grandmother speaks to her in the language of the Anishinabe, of which she is the last fully fluent speaker on the Otter Lake Reserve. Tiffany hardly understands a word, but her grandmother continues to do this. How is it that Pierre understands her? This novel is clearly written for a young adult audience. It is just creepy enough to keep their attention, but not too scary to cause nightmares. Much of the focus is on Tiffany and her boyfriend, with that story running parallel to that of why Pierre is visiting the reserve. I continue to enjoy the writing of Drew Hayden Taylor and look forward to another of his works. I loved Crazy Dave! It's hard to come by -- I think it's out of print, but well worth the search. The author may still sell it off his website. I went to talk to him after I read it to try and talk him into speaking at our conference (DS) but we couldn't come to terms. I also really enjoyed The Night Wanderer and think Drew should do more YA.